Not Verified | Rhodes is beautiful and me and my friends had a fab holiday however the chaos at the airport on departure was appalling. 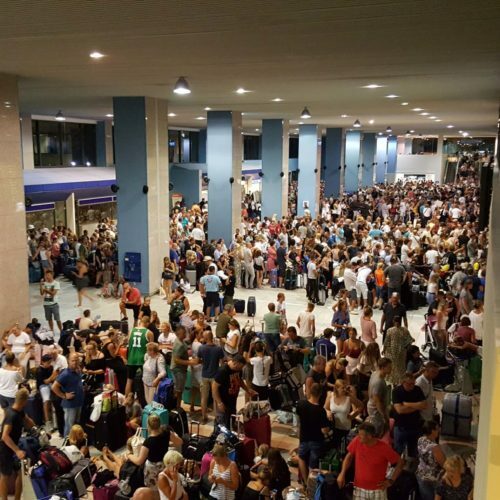 I have travelled all over the world and have never in my life experienced such a catastrophe, Jet2 staff were a little more helpful to their customers, Tui staff could not have cared less, appalling, I pity anyone travelling with children or older people, utterly disgraceful in this day and age. To top it all on arrival back home one of my friends suitcases did not arrive, no one in arrivals at Newcastle to help either, it seems to me as long as travel companies get your money they don’t care maybe they need to spend less on PR and more on customer support. Loved Rhodes town, the people were so lovely but beware of the airport. 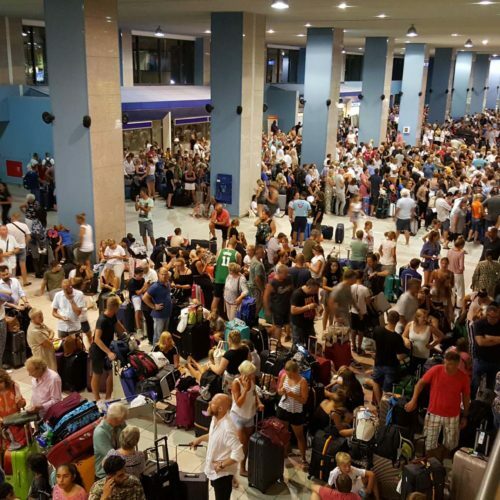 "absolute joke of an airport"
Not Verified | Complete shambles. Very hot, no aircon or air coming in to the place. Three flights arrived at the same time and all luggage to the same belt took over an hour to reclaim luggage. 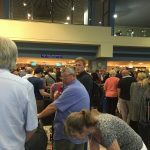 Departure last night was beyond a joke queues outside the airport once inside queue to get baggage weighed then queue again to get baggage on to a belt then queue again for security and then again for passport control who were busy arguing with each other and wouldn't let anyone through. It took 3 hours to get to this point and nearly missed our flight. All flights were delayed by around 40 minutes and no information or assistance given by any staff absolute joke of an airport. "nothing enjoyable about Rhodes airport"
Not Verified | After 25 years of travelling several times a year this is the worst airport I have ever been to. We arrived 2 hours and 10 minutes before our flight and spent the whole time being shuffled from one massive queue to another first one to check in then another to check luggage in, why cant this be done at same desk? When we finally arrived upstairs in the airport we had to rush to our gate as we were told our flight was boarding only to stand in another queue for another 10 mins without moving .I usually enjoy time at the airport browsing around the shops and having a relaxing drink prior to the flight however there was nothing enjoyable about Rhodes airport and it put all four of us travelling off ever going to Rhodes again. If I could give 0 rating I would! ✅ Trip Verified | An utterly chaotic shambles of an airport which came close to ruining an exceptional holiday. We would be reluctant to return to Rhodes because of this particulary as we now know this was not a one off. Too many flight arrivals and departures are crammed into a small airport which is completely unabale to cope. There is no warning of this by the travel reps, otherwise people would get there earlier. Every display board shows contradictory information and we were told to ignore the main large check in display! Those tour reps that are present can do nothing to help and far too many people try to push in to the queue making for crazy, hot tempered conflict. You have to queue for the length of the terminal to check in and then repeat the same process for the single scanner along with every other person in the airport (thousands). The staff appear blissfully oblivious to the stress and anxiety of this. The scanner repeatedly jams up and no one moves. There are plenty of officials standing around twiddling their thumbs, it would be helpful if they could do something to ease the flow! It is difficult to understand how the authorities think this carnage will attract repeat visitors. Such a shame for a beautiful island. ✅ Trip Verified | What a terrible place. I'm glad the breweries on the island are not operated by the same company. The systems in place for baggage defy logic. We arrived and shared a carousel for baggage collection with 4 other flights, lots of hot annoyed people pushing and shoving! It took an hour and a half to collect all our luggage, there were 4 in our party. Departure wasn't any better. Queue to have your bags weighed and receive boarding passes, then queue again to deposit your bags through a scanner! A ridiculous system! 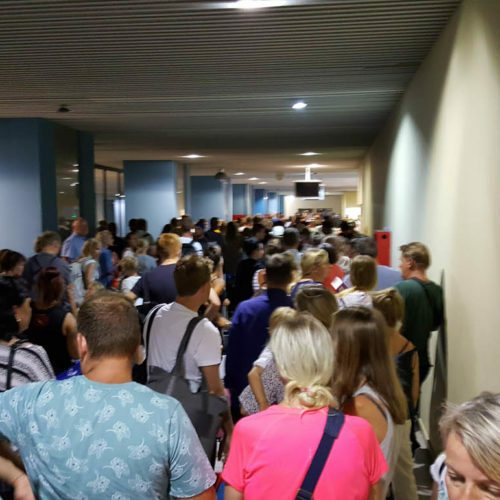 I only wish we could avoid this airport but we love Rhodes so much! I was told a German company run the airport, I cannot see that this is true, I have flown in and out of a number of German airports and never had any problems, they were all very efficient. 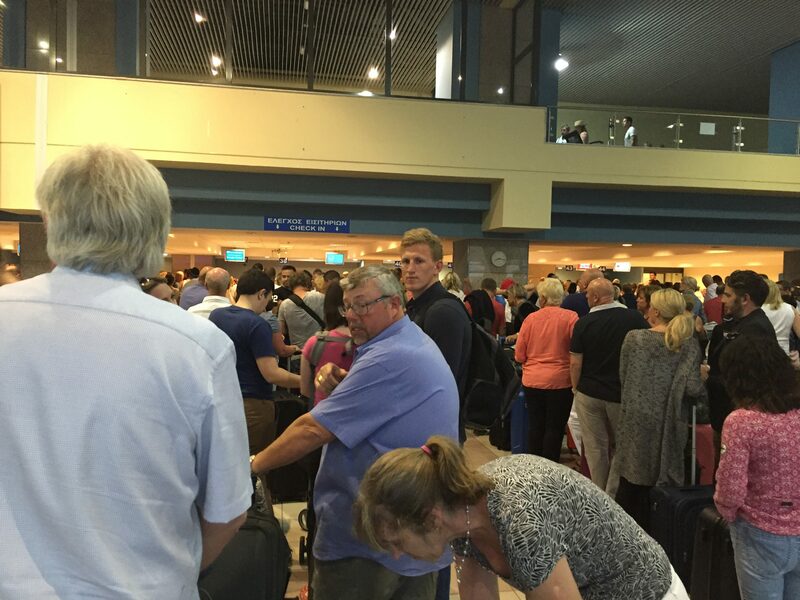 Rhodes staff need to visit virtually any other international airport in Europe and learn. "we found it to be bright and clean"
✅ Trip Verified | Had a late flight home with Jet2 on Saturday 11th August. Having read the reviews I expected a third world country airport. This is a modern building and we found it to be bright and clean. There was the separate screening of hold luggage after checkin but didn't prove a problem. There was 7 of us travelling together. Security was quick and friendly. Although airport was very busy we found seats together in departures. Some lovely shops there too and a small bottle of water was only 50 cents. The loos were clean too. ✅ Trip Verified | Total chaos and indifference. Due to system outage the waiting time for check-in was finally 6 hours. No water provided, no place to sit in a totally overcrowded airport hall. Families with little toddlers ending up at the end of the queue because of pushing people. Rude behaviour, shouting, heat. 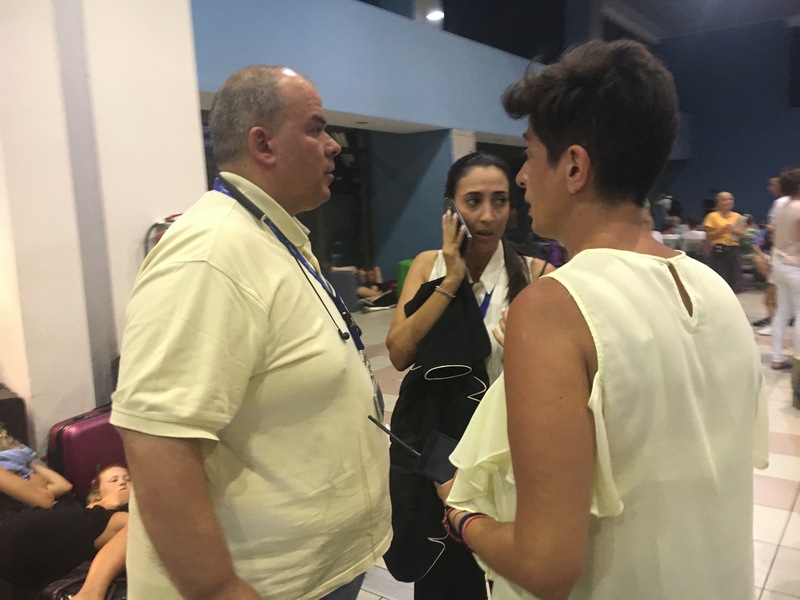 During the 6 hours no communication at all from airport staff on whether planes would go or be cancelled. No diapers or help provided upon request for support for feeding and cooling of baby child. Again long waiting and chaos before security check. 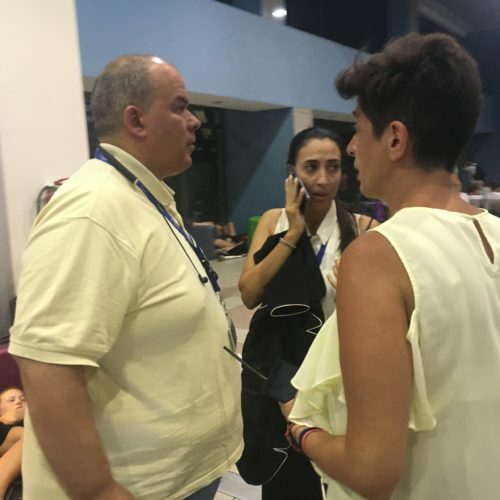 If there would have been a fire or other incident the crowd would have been out of control, without any management or organization from the airport. An experience not to repeat. ✅ Trip Verified | It’s hard to believe that this airport was not situated in a third-World country. Their systems were down and they were having to manually check luggage in. We queued almost 4 hours in muggy heat to do this with zero help or information from Jet2. Amazingly the flight time on the board stayed constant the whole time - no updates were provided whatsoever. Jet2 were utterly useless - affording people one bottle of water per party only when you had reached the front of the queue. You would have thought that they were handing out Bollinger by their attitude! Minutes later you had to drink/abandon it as you went to passport control to wait some more. There was no update information at the gate - the flight was still showing 10pm even though by now it was after 11pm. Finally got on plane and we sat on the runway for a further 1 hour and 45 minutes waiting for 3 passengers or so they told us. The ‘three passengers’ never actually got on and we were eventually told that ‘ all paperwork has been verified’ after one of the airport staff on a high vis jacket had bumbled back and forth between the terminal and the plane, we finally embarked on a four hour flight. Shockingly bad service. 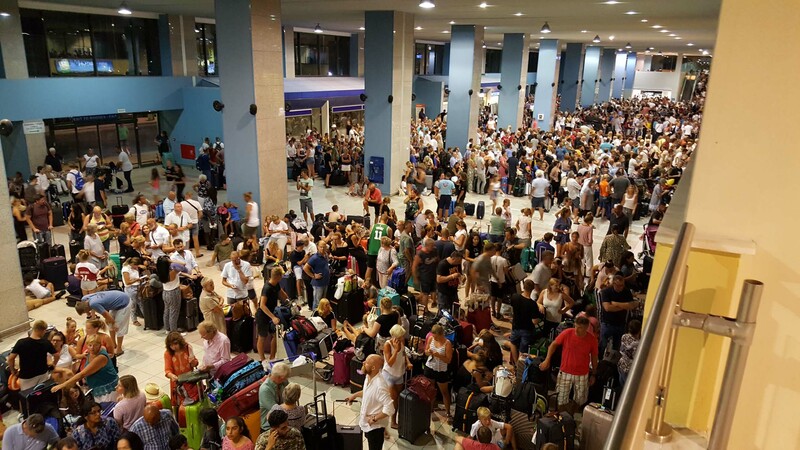 Avoid both this airport and Jet2 like the plague. "pax waiting and sleeping on floor"
✅ Trip Verified | About 1000 pax waiting and sleeping on floor. Computer problem, no flights landing or departing. No drinking water available at airport! No air-conditioning on or working. Ignorant management. No information at all. After waiting 6 hours we had to find a hotel at 4am without any assistance’s of the unwilling to help airport staff. Don’t travel to Greece, if you don’t have to. Not Verified | When we arrived we had to wait outside on the runway because 4 or 5 other flights arrived at the same time. Hundreds of people waiting to have their passports checked, took a good hour before it actually started moving. It only started moving when they got a couple of policemen checking passports, my wife has a Czech passport the policeman had to go ask the immigration officer if it was ok to let her in! How safe are these passport checks not to mention how safe is it to keep hundreds of people on a runway? We even had an airplane turn and park about 10 metres from us.